Trial Island lighthouse, off Victoria, photographed by Deddeda Stemler. A lighthouse keeper’s schedule comes with a clock that never stops ticking, with tides that rise and fall and rise again, with winds that howl when not calm, with a radio that at any time can bring news of desperation. Steve Bergh has kept an eye on the coast of Vancouver Island for 27 of his 59 years. For the past two decades, he has been based at Chatham Point Lightstation, about 40 kilometres north of Campbell River. He lives in a house with his wife, Alice Woods, on a bluff overlooking the confluence of Discovery Passage and Johnstone Strait. A small building houses a fog signal. The yard includes a helicopter landing pad. Among his duties is a responsibility to pay close attention to the weather. It is a task more pleasant on some days than others. His workplace is an idyll, especially on a sunny day, with a spectacular vista overlooking waters in which orca frolic. Some time ago, he told his employer he planned to retire on Jan. 5, 2010. He has since withdrawn the request. He has a fight on his hands. Once again, lightkeeper positions on the coast are to be cut to save money. Three lighthouses around Vancouver Island are soon to lose their keepers. 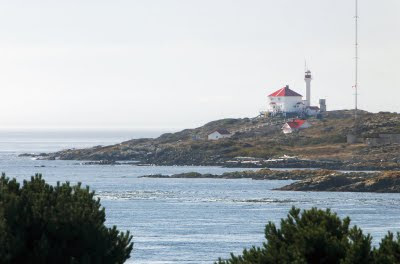 Coast guard officials say automated equipment eliminates the need to continue staffing at Cape Mudge on Quadra Island, Entrance Island off the tip of Gabriola Island, and Trial Island within sight of the lights of Victoria. Mr. Bergh is serving his third, two-year term as elected president of B.C. Lightkeepers Local 20232, Public Service Alliance of Canada. He’s putting off retirement to make the case for continued staffing of lighthouses. “I feel an obligation to my membership and to the public I serve,” he said. His normal workday includes such duties as providing weather reports every three hours and keeping all the machinery in good operating condition at all times. It is what happens on abnormal workdays in which the lore of the lighthouse keeper is built. Mr. Bergh, born at Arcadia, Calif., took to the sea at a young age, fishing for albacore tuna off the California coast. In 1971, with his homeland bitterly divided over the conduct of the Vietnam War, this son and grandson of veterans decided to move to Canada. After a few years in Winnipeg, the lure of the sea brought him to the West Coast, where he resumed his work as a commercial fisherman, which he continues to this day. His first posting as a lighthouse keeper was to Estevan Point, on an isolated peninsula jutting into the unforgiving Pacific Ocean northwest of Tofino. Forty-five years earlier, on a late summer’s evening in June, 1942, Robert Lally and his family fled the home at Estevan Point for a nearby hillside after shells began to explode around the lighthouse. The front page of the Globe heralded the shocking wartime news with a banner headline reading: Vancouver Island Shelled by Enemy Sub. Many years later, a fellow named Don Graham contended the attack was made not by a Japanese submarine, as official histories state, but by an American warship as part of a conspiracy to aid the Canadian government in promoting conscription. It was a controversial and unproved theory rejected by many. Long hours spent in a fortress of salt-spray solitude afforded him the time to write to write two popular histories about the plight of his fellow lighthouse keepers. He chronicled the venerable, if lonely, way of life of the lighthouse keeper by trolling the diaries, letters and logbooks of his predecessor, uncovering such fantastic tales as a cow blown into the sea by fierce winds at Triangle Island and a keeper’s wife, driven so madly suicidal by loneliness, being strapped to her bed until her husand could return with medical help. Mr. Graham, who died six years ago, was a fierce opponent of government efforts to make redundant the human presence at lighthouses. “They haven’t invented a machine yet that can see or hear a person in distress and take action as light keepers have done unflinchingly on this coast for 150 years,” he once told a reporter. His words are echoed by Mr. Bergh, who cites many instances when the safety of mariners depended on the presence of these lonely sentinels. In June, the keeper at Trial Island spotted several kayakers in the water alongside their vessels in the waters between the island and the shore. Five were plucked from the cold sea, while another swam to shore. At Chatham Point, a lengthy stairwell stretches from the bluff down to the waterfront. The steps are painted red, the handrails white, matching the telltale colour scheme of all lighthouses. It ends at a dock at which a boat is always kept moored for emergencies. “I’ve pulled people out of the water. I’ve searched for people who’ve fallen overboard. I’ve provided first aid,” Mr. Bergh said. “We provide mechanical repairs to vessels and we provide sanctuary for the shipwrecked.